Many people assume fruits like blueberries are the best for you. However, if I had to choose just one fruit, it would be the humble Kiwi Fruit! Now don’t get me wrong, I’m a big advocate of all fruits and I believe we need to eat a variety of healthy fruits each day! But for the purpose of answering that question, I would go with Kiwi Fruit. Why? Because Kiwis have the highest nutritional density of any fruit in the world. Kiwis provide more nutrition per mouthful than any other fruit. Let’s have a closer look at why Kiwi Fruits are so good for you. Immune Boosting – 1 Kiwi Fruit provides you with your daily vitamin C requirement. In fact, 1 Kiwi contains almost double the amount of vitamin C found in 1 orange. Vitamin C is an essential nutrient when it comes to your immune system & can help with reducing your risk and severity of colds & flus. 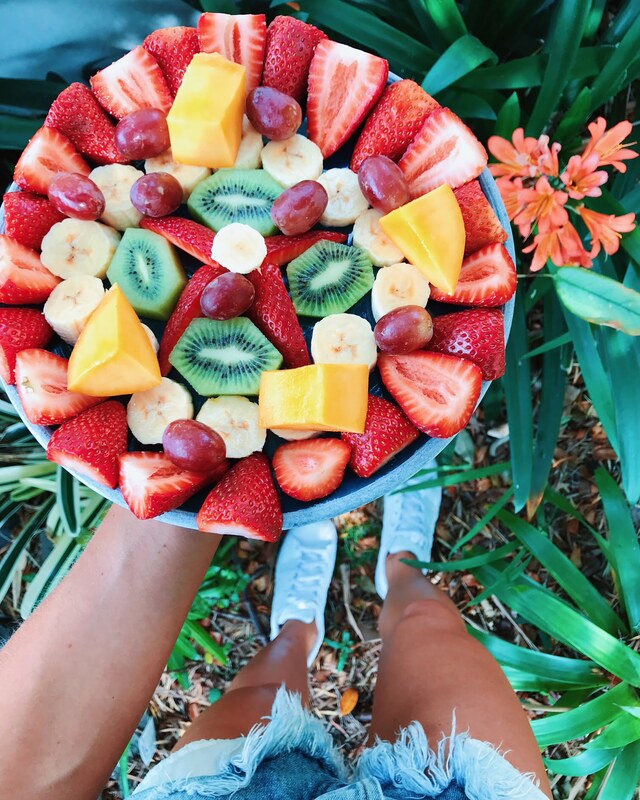 Skin Health – Vitamin C contributes to normal collagen formation for healthy skin & as Kiwis are an excellent source of Vitamin C, they are great for skin health. The vitamin C, as well as vitamin E, in Kiwis also acts as an antioxidant to help defend your skin cells from free radical damage, which can slow the aging process & keep your skin looking youthful. The outer most parts of the fruit contain the highest level of antioxidants, so for the best skin benefits, keep the Kiwi Fruit skin on. Remember it like this – Kiwi Fruit skin is good for you skin. Kiwi fruits are so beneficial for your skin you can even make them into a facemask. Simply mash a kiwi with some plain yoghurt of choice, mix in a teaspoon of Manuka honey & spread over your face. Eye Health – Kiwi Fruits contain the carotenoids lutein and zeaxanthin. These are important for the pigment in the macular of your eye & can help with keeping your eyes healthy. Digestion & Gut Health – Kiwi Fruits are a natural source of dietary fibre. They contain a mix of both soluble and insoluble fibre, but it’s the insoluble fibre found in the Kiwi Fruit skin that is most beneficial for your gut. Insoluble fibre adds bulk to your stools, preventing constipation and aiding normal bowel function. So for optimal gut benefits, be sure to keep the skin on your Kiwi Fruit. Heart Health – The soluble fibre contained in the black seeds of the Kiwi can aid in lowering cholesterol absorption and maintaining normal blood sugar levels, both beneficial for your heart. Kiwis also contain potassium, a mineral essential for healthy blood pressure and heart function. 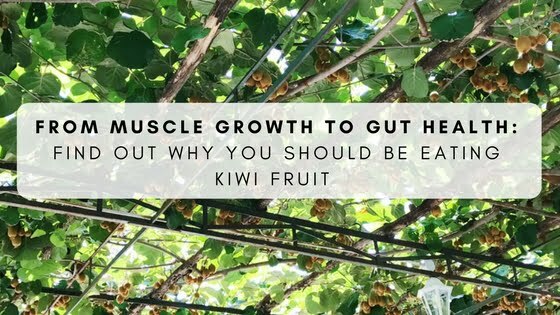 Muscle Growth – Kiwi Fruits contain a unique plant antioxidant called actinidin. Actinidin is an enzyme that helps break down protein, making protein more readily absorbed by your muscles, which is especially beneficial after a workout. 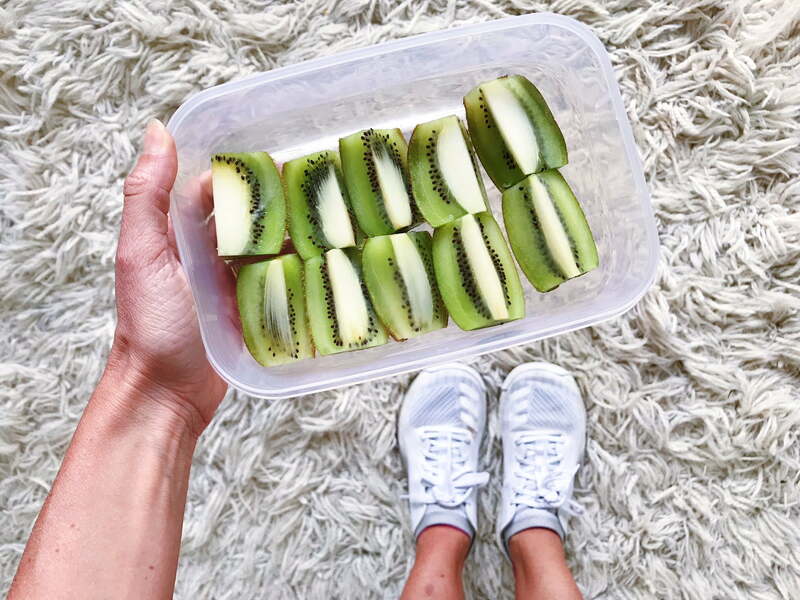 So adding a Kiwi Fruit to your post-workout recovery meal, snack or protein shake will help increase protein uptake to your muscles and help you grow lean muscle! Get the recipe for my ultimate post workout Kiwi Fruit Smoothie here. Weight Loss – Due to the high fibre content and low Glycaemic Index (GI=39) of Kiwi Fruit, they can aid weight loss by keeping you feeling full & stabalising your blood sugar levels. Normal Body Functions – Kiwis contain essential nutrients required for healthy living including folate, Vitamin K, Copper & Maganese. 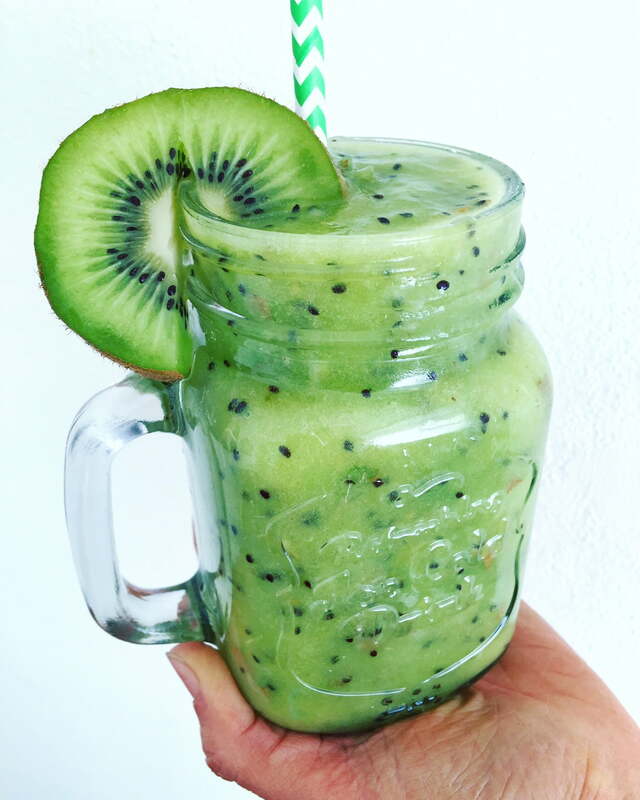 My Ultimate Post Workout Kiwi Fruit Smoothie: Get the recipe here. How to Pick A Ripe Kiwi Fruit – A ripe Kiwi should be firm to touch but ‘give’ a little when gently squeezed between your thumb and forefinger. 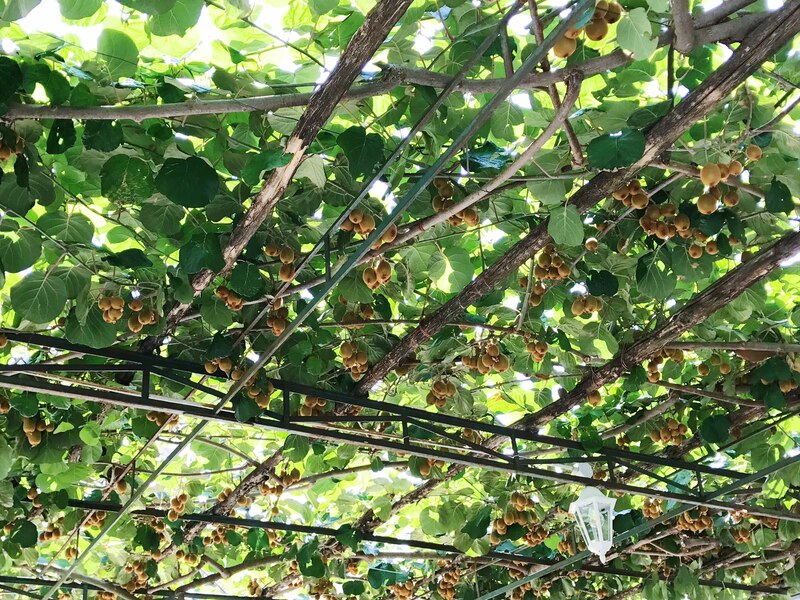 The skin should be mid-to-light brown in colour for green kiwifruit, and a slightly more golden lighter brown for gold kiwifruit. It shouldn’t be shriveled, bruised looking, or be dark brown in colour. Frozen Kiwi Fruit Snacks – For an easy and delicious summer snack, grab some ripe Kiwi Fruits, wash them well, cut the ends of & then slice. Place in a container & freeze. Once frozen, enjoy them as a snack or add them to your morning breakfast smoothie or make into nice cream (see recipe below). 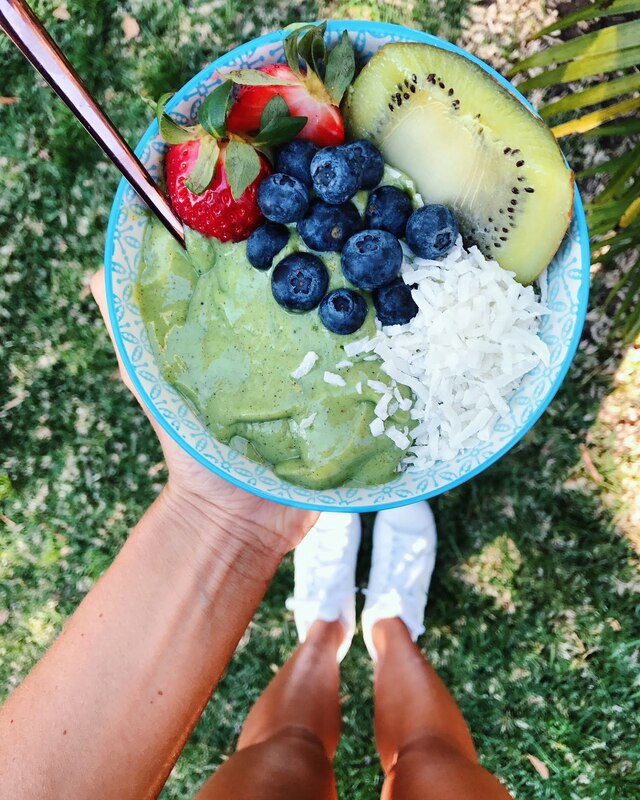 Kiwi Fruit Nicecream – Using your Frozen Kiwi Fruit Slices (see above), simple place them in a blender and blend until smooth and creamy. Scoop out and enjoy your health Kiwi Fruit Nicecream. Fun Fact: Kiwi Fruit grow on a vine like this one I snapped a pic of when travelling. Sponsored Content: This article is proudly sponsored by LoveKiwis. Why? Because I love LoveKiwis and only recommend companies/brands/products that I truly believe in and who share the same approach to health as I do. All opinions are my own and not influenced in any way.